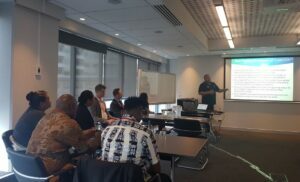 The OCO in partnership with NZ Customs, PICP, NZ Police, APG, JIATF West and Strategika Group conducted a 5-day Sub-Regional training on Financial Crime at the NZ Customs Training Center in Auckland, New Zealand from 10 to 14 December 2018. 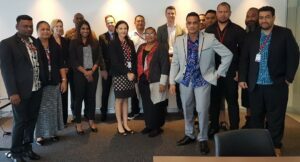 The Training saw 12 Customs officers from Polynesian countries attend the week long training. The program is part of the declaration of Partnership that the PICP, OCO and PIDC are party to. The three Regional Agencies have committed to conducting joint training to law enforcement agencies and relevant parties on pertinent issues that’s linked to transnational organised crime. One of the key features of the workshop was the roll out of new OCO secure communication platform APAN. The System would allow OCO Members to now share intelligence and sensitive information on a secure platform. The APAN System was provided by the Joint Inter-agency Task Force West [JIATFWEST]. 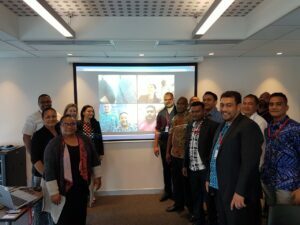 PICP has over the years been using APAN as its communication tool, this will also pave the way for more collaboration between partners using secure communication tools. The overall aim of the workshop was to create awareness and understanding on the impact of illicit financial flows and the social harm it creates to national and regional economies. The training also helped develop financial literacy and the use of existing tools and networks to combat money laundering and other financial crimes. The training also highlighted how transnational organised crime and its related offenses, money laundering, currency smuggling, environmental crime and tax fraud have cross jurisdictional implications and necessitates inter agency and regional cooperation and collaboration to systematically address these issues. OCO will continue to work closely with its key partners in creating awareness on this continuous evolving security landscape.